The start of my first trip across the Atlantic ocean began at 4:30A- up and away to the airport and the first of three flights before I arrived at my goal, Pagosa Springs, Colorado. The flight was on schedule and I landed in Chicago at noon local time. The next flight was not until the next morning so I went into downtown Chicago to kill some time. With the time difference in my body and a big backpack on my back, it was a pretty tough afternoon - I walked around, shopped a little, ate a snack and then I was satisfied. I went back to the airport and checked in to the Hilton - today's top decision - went to sleep like a clubbed seal around seven. Woke up at 2:30A and could not sleep anymore. Well, just to wait for the next flight, which took me to Phoenix. And in Phoenix additional pending before the last flight to Durango. Once there, I picked up my rental car, a Chevy Cruze, and an hour later I was finally in place in Pagosa Springs. 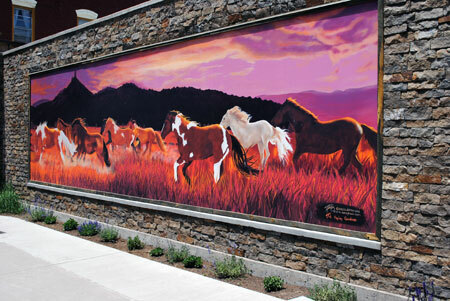 Pagosa Springs is a pretty small place that is most famous for its natural hot springs. The local situation in relation to the Rockies and adjacent desert plateaus give it a unique microclimate with 300 days of sunshine per year, while there are four distinct seasons with really snowy winters. The city is surrounded by the 3 million acres (12,000 km²) large San Juan National Forest, and adjacent to the largest wilderness area in the state of Colorado, Weminuche Wilderness. The rest of the day I installed myself at Pam and Tom at Be Our Guest Bed and Breakfast where I would spend the next 13 nights. I woke up around 7:00A after a good night's sleep - though far from refreshed with the earlier traveling time in the body. I took a really lazy day which I mostly devoted to stroll around and performing classical tourism. I visited the local tourist office and was told about the city's history - interesting. The name Pagosa Springs is supposed to come from the Ute Indians; "pah" meaning water and "gosa" which means boiling, which is aimed at the hot springs in the area. I also had time to book a fishing guide for the next day and rafting for another day later. Woke up 5:30A and felt quite keen - now it was finally time for fishing! I met my guide Joe at Wolf Creek Anglers just after 8 and we went off to Williams Creek. It was still pretty high and muddy water - spring had been later than usual this year and there were still a lot of meltwater from the mountains - but we'd proboblay find fish anyway, Joe said. Williams Creek is a relatively small river compared to what I'm used to fish. It flows through dramatic scenery and the rapids is quite fast - no still water here. The fishing method was also unusual for me - we would fish with sinking flies in a way I never had tried before. Joe made me a rig that from the end of the fly-line to a head was rigged with a float, lead sinkers, a big attractor, and finally a small nymph - all on a suitable distance between each other. This kind of rig was by no means unusual in the United States. I used this kind of rig throughout my trip, but as the waters fell, the lead could be exchanged for another fly instead. They did not make hangers which I was familiar with from our own classic treks. Instead they, when tying in a "between the fly", they tied it in as a usual end fly, at the end of the leader. Then they tied a new piece of line to the bend of the fly and continued the rig in that way. I have a feeling that this approach reduced the amount of clutter somewhat. This type of rig was to be fished upstream, and as soon as the float made an unexpected movement or fell through the surface, you had to be alert and tighten the line. The method truley worked and I got some fish, but it was not always easy to tell when it was time for the counter-thrust, and even a bit frustrating to lose so many flies when they got stuck in the bottom. This was just something to get used to the claimed Joe. We fished us through a good portion of Williams Creek this day and I got some fish - mostly trout but also a rainbow and a cutthroat (the last one a new species for me). No big fish, but some of them in "food size". It was a good guide accession that showed me where and how to catch fish under the prevailing conditions. 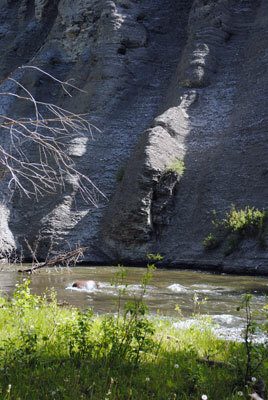 It was a very active fishing where you went from pool to pool, fished all the interesting little backwaters, pools and stream edges, and that meant a lot of climbing in the often steep river banks. Hopefully the Stonefly would start to hatch a bit more frequently in the coming week, and then it would be time for dry fly fishing instead. 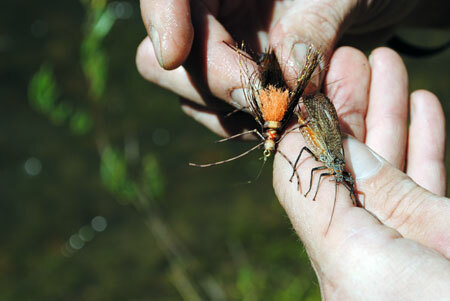 The Stonefly was a really large dragonfly that is unlike anything we have in Sweden, and the trout could become as crazy when they hatched. No fishing today, a rafting trip instead. I made a "full Piedra" with the Pagosa Outside Adventures - an all-day technically challenging, and fantastic fun, rafting trip. Tiring for the back, however, that are not quite used to this amount of physical activity during a single day. Slept well that night. Fishing day again and today I started with buying some equipment - a Winston Boron IIT, 9 foot, Class 5 (in four pieces - a perfect rod for travelling) and a Ross reel with a WF-line. The current dollar exchange rate and the price situation in general made this a real bargain. A couple of flies, som leader material and some other stuff, then I was ready to fish. 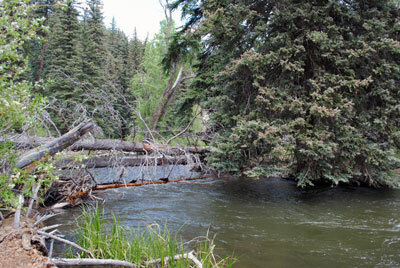 I went to Williams Creek again and began my fishing where we had finished the guided tour two days earlier. The water level had gone down slightly, but it is still no fish in the surface and it was not many insects viewable, so it had to be fisging nymph again. 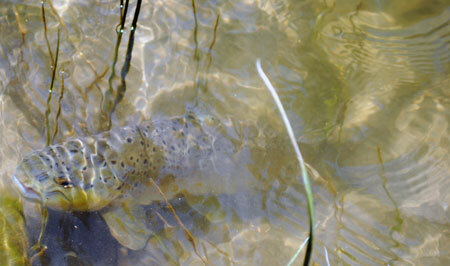 The day started quite well with two caught rainbows in the first pool, but then it became a bit more sluggish. Fishing myself downstream and got some trout, but it was not as good fishing as two days earlier. Continued the day with a visit to Williams Creek Reservoir - a man created reservoir that is surrounded by incredibly beautiful scenery. Did not fish there that day (eat my lunch there instead), and went fishing just below the reservoir instead. No result there and did not fish anymore this day. Still miss to many fish due to my lack of experiance with this type och nymph fishing - it is not easy to determine when the float is moving because of a fish, and often a disappearing float only means that the fly has contact with the bottom. Anyway, a nice fishing day and some catched fish. After three intensive days of fishing and rafting, I needed (and especially my back) a much needed day of rest from physical activity. Got massaged and followed up with a visit to one of the plants with hot springs - a peaceful and relaxing day. Fishing day again, much more alert after yesterday's treatment. Once again off to Williams Creek, and once again began my fishing from the same place as last time, fishing downstream. For once, a little cloud in the sky, but otherwise warm. The water level was declining further, and I saw some insects on the creek, so today, I started to fish dry (but to guard me, with a nymph hanger). The nymph gave me some fish, but not a single stroke at my dry fly. Held on for quite a while with the dry - at least one fish should eventually rise to the fly I thought, but no! 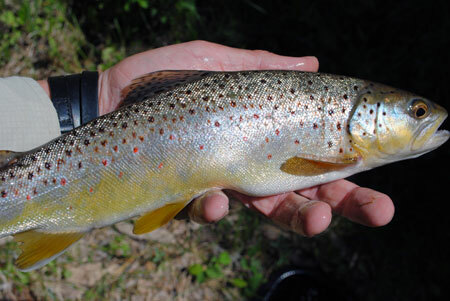 The most difficult fishing day so far on my trip, but I got a handful of brown trout and rainbows at least. Just before I was on my way home I met a bunch of fishermen and asked how they were doing. They had not had a single bite all day, so I do something right after all! A shorter trip today. Began in the same place as usual, but I was fishing upstream instead. Wise from yesterday the nymph rig was on from start, and it initially gave quite good results - it got two decent rainbows in the first three throws and a couple of pools upstream proved to hold some trout. After a few hours, however, a big cloud area came in over the mountains, resulting in quite a breeze, and the fishing instantly became much worse. Stopped fishing quite early and took it easy the rest of the day - strolled around in Pagosa and finished the day off with a tasty dinner at one of the city's better restaurants. This was a real sunny and nice day for tourism. Drove to Durango for some shopping. 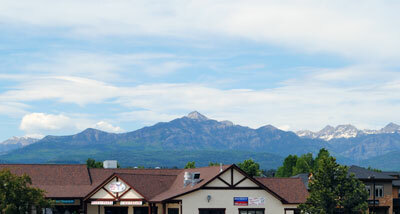 Nice city, larger than Pagosa Springs and with quite nice shopping opportunities. The old part of town was also interesting just to walk around and look at - a piece of American history. It has been recorded a lot of western movies in the area over the years and that you could see in the souvenir shops - the Duke (John Wayne) was a popular motif on all sorts of things. Also visited a Walmart, which was an experience in itself - one wonders how they can have such low prices. Durango, and the way there, is beautiful and the trip was well worth it. Continued the day with a visit to the Rocky Mountain Wildlife Park which is located about 5 miles from Pagosa Springs. I got there just in feeding time for the animals, which included a guided tour through the park. 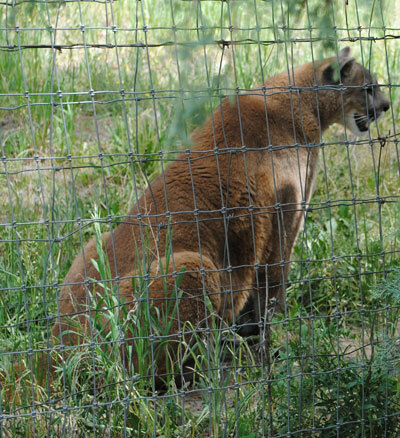 The park held a number of the animals residing in the area; elk, grizzly bear, black bear, bobcat and mountin lion. Elk was the only animal of those that I managed to see when I was out on a fishing trip, and I am just as happy - would probably had not appreciated an encounter with a grizzly. However, it was not bears and mountin lions you should beware of when you were out for fishing (it was extremely rare to meet a predator in the open air) - what you had to watch out for was snakes. Was lucky to avoid meeting such during my stay. Time for a big fishing day again! It was a glorious morning - not a cloud in the sky, hot and windless. Started of by trying Williams Creek Reservoir - it was flat calm and you could see some fish taking insects in the surface. Tried to fish dry, wet and streamer, but with no results. Beside me sat a family that was using worms, and they got some fish now and then. As usual, it appears that the worm is best regardless of the water you get to (except Stora Harrträsket of course). Tired pretty soon and went off to Williams Creek instead - may try to pick the lock for success in the reservoir at another time instead. Has begun to develop a sort of love-hate feeling for the pool I always begin fishing in. On one hand I manage to get fish there every time, and on the other hand I also loose flies in it every time. There is a large tree in the middle of the pool and the risk for getting stuck in one of its branches are great because you have to let the flies sweep past quite close to the tree - this is where the fish tend to be standing. The pool is so deep that it is impossible to wade out to that part of the tree where most of the flies tend to get stuck. This day the pool gave me two rainbows before I lost the first flies. The water level is clearly lower and the water is clearer than the first few days, but it's still sinking flies that catches the fish. 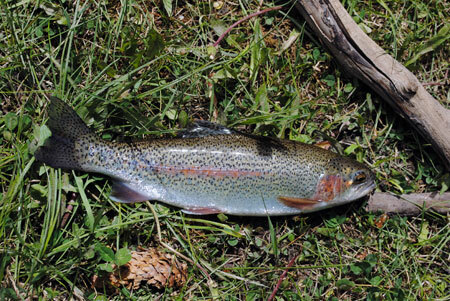 Fished myself down to the fence and it went really well - several trout and a few rainbows, and some were quite decent. Turned and began to fish me upstream through the other side, and a bit up, I found a small pool I had missed on the way down. The pool instantly gave me a trout, a couple of throws later, a dropped fish and a few throws later, a giant blow! The fish was huge, I felt it immediately - much bigger than everything else I had on the trip so far. It made a short rush and then just stopped at the bottom of the pool. There it stood and I could not get it to move. I put such hard pressure on it as I dared, but it refused to move. Just below the pool it was quite powerful rapids, and a lot of tree debris in the river, so I did not dare let go of the pressure - I did not want it to go downstream because then it would definitely be lost. I began to gradually bring myself closer to the fish and started to think about how I could get it to start moving when it suddenly came loose. The hook just lost its grip, and had also begun to straighten out. No nice feelings after this blow and it took a while before I could continue fishing. Continued after a while and fished my way up, past the love-hate-pool and further upstream. It became hotter and hotter during the day and in the afternoon it almost became to hot. It seems that the fish also thought so since the frequency of fish contact became lower and lower, but I manage to get a couple of trouts in the afternoon before I called it a day. A good day of fishing that could have ended in success if the big one had let itself be catched. 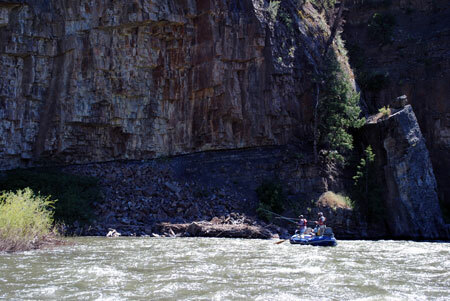 A guided raft fishing trip on the lower San Juan booked for today. A boat is an absolute necessity on this trip since most of the river crosses private land. You are permitted to travel on the water, but not to enter the shore. This means that this part of the San Juan is not fished very much, and my guide Mike basically promised big fish. 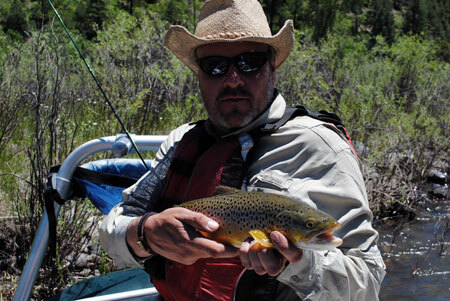 We started the tour with dry fly fishing, but it produced no results so we switched to wet flies after a while. Mike steered the raft past the rocks and falls and made sure we approached the streams and pools that were interesting in a nice way. In some places you could stop for a while in a backwater and fish an interesting pool with several throws, but usually you only had one chance to hit the right spots. Despite my unfamiliarity with this type of fishing from a boat, the fact that I still miss too many counter-thrust, and that language problems made me occasionally misunderstood my guide's commands, it did not take long before the first nice rainbow was caught. Followed it up with a nice trout, and so it went on - every now and then a nice fish sat on the hook. It was another really hot day. The fishing trip took almost eight hours (including a three-quarter lunch break at the only place on the stretch of land where the owner allows you to set your foot on the shore). There were plenty of big rainbow and brown trout in the river, and also I managed to get a Sucker - a rather nasty bottom-dwelling fish that looked quite funny. Just a short fishing trip today. I went off and tried the East Fork of San Juan for an hour in the morning, but with no results. Stayed only one hour since I had booked an appointment with aBODYofART.com for the purchase of a physically permanent memory of this wonderful holiday - it took the rest of this day to complete. My last fishing day in Colorado and a final visit to Williams Creek. My love-hate-pool did not deliver any fish for once, but downstream it was better and I got a bunch of trout and rainbows on the way down to a bit downstream of the fence. As usual, it was the nymphs that delivered, and today especially the small ones. You lose fewer flies now then, now that the river's water level dropped several inches compared to the beginning of my journey, you often can wade out and wiggle loose the fly that got stuck. The downside is of course that the pool must rest for quite a while after you been out walking in it. An incredibly hot day, so I stopped fishing about an hour after lunch time. The rest of the day I relaxed some, and packed all my stuff preparing for my trip home to Sweden. Up at 03 to begin the journey home. More than 24 hours later, at lunchtime Swedish time, I was finally home. By car from Pagosa Springs to Durango, wait for the flight, fly from Durango to Denver, waiting for the flight, fly from Denver to Chicago, wait for the flight, fly from Chicago to Stockholm, and finally car from Stockholm to Sundsvall - quite a trip. Nice to be home again, but I know I will long to return to Colorado. My trip to the U.S. was a real treat! The American was generally very open and friendly, the environment was incredibly beautiful, the weather was fine and I learned a lot. Regarding the fishing, it was interesting to see how they conducted their fishing activities, and see what differences, and also similarities, there are in the fishing culture in Sweden versus fishing culture in the United States. When we were out on guided tours, pure C&R was the regulation, but otherwise the bag-limit was two fish per day in the National Forest. I had guessed that the restrictions would be even harder. One problem I recognize from home is that some of the local people do not care about fishing rules and kills all the fish they can there too, and since it deals with local fishermen it is a quite difficult problem to deal with. It was incredibly clean everywhere despite the fact that the National Forest is a very popular recreation area. The motto "leave a place cleaner than when you arrived" (as opposed to our "leave the place just as you found it") seems really embraced. 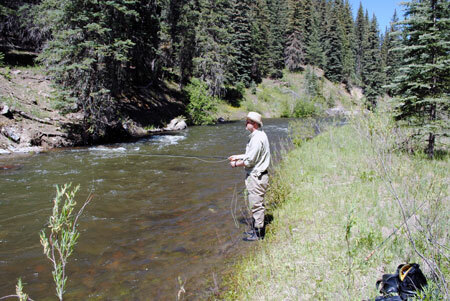 The fishing in the area is supposed to have one of the best periods when I was there, but due to an unusually late spring the waters were unusually high and the dry fly fishing never got going. The nymph fishing went well though. The best time of day for fishing are generally mornings and evenings. It becomes, particularly in the middle of the summer, too hot in the middle of the day. The flies that worked best for me was Pat's Rubber Legs (a large Stonefly-nymph), Tungsten Reckoner and Green Hornet (two small nymphs). 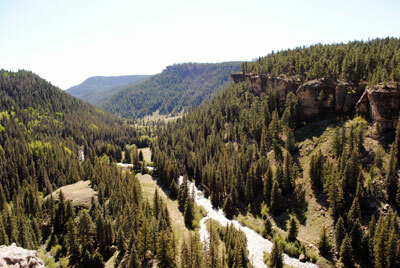 Finally, I really recommend Pagosa Springs and its sourrundings as a place to visit - a great place to be! - Pam and Tom at Be Our Guest Bed and Breakfast - great breakfasts, cozy accommodation and a good company. - Joe and the others at Wolf Creek Anglers - a warm welcome, professional tours and other assistance during my stay. - Markus at San Juan Sports Massage - fixed my back, and thereby saved my stay in Colorado. - Dan at Pagosa Outside Adventures - an amazing whitewater rafting with a professional and nice guide. - Kelly at aBODYofART.com - a job well done on my left shoulder. - all the other nice people I met during my stay in the U.S.